Samsung Galaxy A10 to come with a plastic body, 6.2-inch Infinity-V HD+ display powered by Exynos 7884B processor with 3GB of RAM and 32GB of internal storage. On Camera, there will be 13MP Rear Camera and 5MP front-facing camera. There will not be a fingerprint reader. The phone will have dedicated slots for two SIM cards and a microSD card. packed with a 4000mAh battery, 5W charging. It will come in Black and Gold. 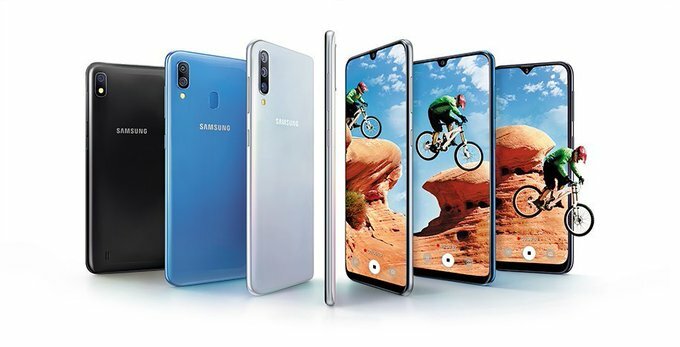 Samsung Galaxy A30 to come with a glossy plastic body similar to Galaxy M20. It will have a 6.4-inch Super AMOLED screen with Full HD+ resolution, Infinity-U design, and Always On Display powered by Exynos 7904 processor with 3/4GB RAM and 32/64GB of internal storage. On Camera, it will have a 16MP primary sensor with f/1.9 aperture and a 5MP ultra-wide camera with f/2.2 aperture and16MP selfie camera with f/1.9 aperture. The phone will feature a dual-SIM card slot, dual-VoLTE, USB Type-C port, and a 4000mAh battery with 15W fast charging. It will have a rear-facing fingerprint reader, Samsung Pay Mini, Bixby, Dolby Atmos audio, Dual Messenger, Samsung Health, and Secure Folder, Available in Black, Blue, and White. 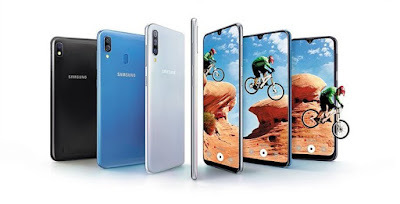 Samsung Galaxy A50 to feature a 6.4-inch Super AMOLED Full HD+ Display powered by Exynos 9610 processor with 4GB RAM+64GB storage and 6GB RAM+128GB storage. On Camera, it will come with a 25MP main sensor with f/1.7 aperture, a 5MP depth sensor, and an 8MP fixed-focus ultra-wide camera with f/2.4 aperture and 25MP selfie camera. Galaxy A50 to come with an in-display fingerprint reader. packed by a 4000mAh battery with 15W fast charging.